A family vacation to the “happiest place on earth” ended in tragedy after two adults were killed and two children were critically injured after a car wreck in Florida. 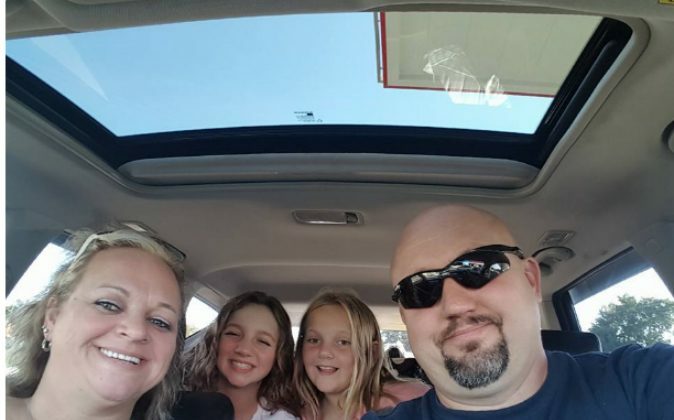 Greg Moyers, 40, and wife Sarah, 39, along with their two daughters—13-year-old Hailey and 8-year-old Sophia—were in their Nissan traveling east in the left lane of Interstate 4 in Deland on Sept. 25, when a Ford Focus drifted into their lane. State troopers said the Ford Focus struck the right side of their vehicle, resulting in the car veering off the road and into a tree, reported the Orlando Sentinel. According to authorities, Greg and Sarah died on impact. The two girls were airlifted to Arnold Palmer Hospital with serious injuries. As of Monday, health officials said Hailey was in critical condition and Sophia was listed as stable. The driver of the Ford Focus, Charles King, 43, of New London, North Carolina, wasn’t injured. The family was in town from Leadwood, Missouri after months of saving for the trip. They were on their way to beach at the time of the 12:30 p.m. accident. News of the fatal accident left their hometown of 1,300 heartbroken. The crash remains under investigation and charges are expected, said Sgt. Kim Montes, a Florida Highway Patrol spokeswoman. A GoFundMe page has been set up for the girls’ to help support them as they transition to life without their parents. As of Wednesday, nearly $35,000 have been raised out of their $100,000 goal.